UMPS CARE charities was once a small movement. Begun by major league umpires years ago, its roots are humble, and its birth went relatively unnoticed by the rest of the league. For example, years ago, while I sitting in a waiting room in my local Veteran’s Administration, Jerry Meals showed up, unannounced, and there was no news coverage. Fortunately, that is no longer the case today, as UMPS CARE has become a league wide movement among all 68 umpires and 30 teams. During their events, you can’t even watch a broadcast without an UMPS CARE plug or a commentator commending an umpire for their pre-game visit to a local children’s hospital. UMPS CARE has given faces and personalities to the men we used to see as stern, cold officiators. It has taken hours upon hours of work off of the field, as well as the dedication of numerous people. Because of that, I just couldn’t help asking umpire Tripp Gibson a few questions. For starters, why would an umpire become involved with UMPS CARE when the charity was so young? Well, Umpire Tripp Gibson reports that while he was a young umpire in the minor leagues, ten years ago, he “really looked up to major league umpires,” and when considering becoming a part of the charity, he took note that “when you see the people that you look up to show how much they care about helping other people, it’s easy to decide to get involved.” Tripp did get involved, and he has participated in bowling tournaments, golf tournaments, children’s visits, and a visit to the wounded warriors at Walter Reed Medical Center. Tripp isn’t the only one that is a part of it, in his family. The Gibson family have made it a personal endeavor to involve UMPS CARE in many aspects of their lives. His wife, Danna, is on the board of volunteers. On any given day, you could ask Tripp’s son what UMPS CARE does, and he’ll let you know without hesitation: “We help kids!” UMPS CARE has changed Tripp and his family’s life, just as much as Tripp and his family change the lives of people around them. “Helping people is the most important thing that you can ever do,” Tripp says. 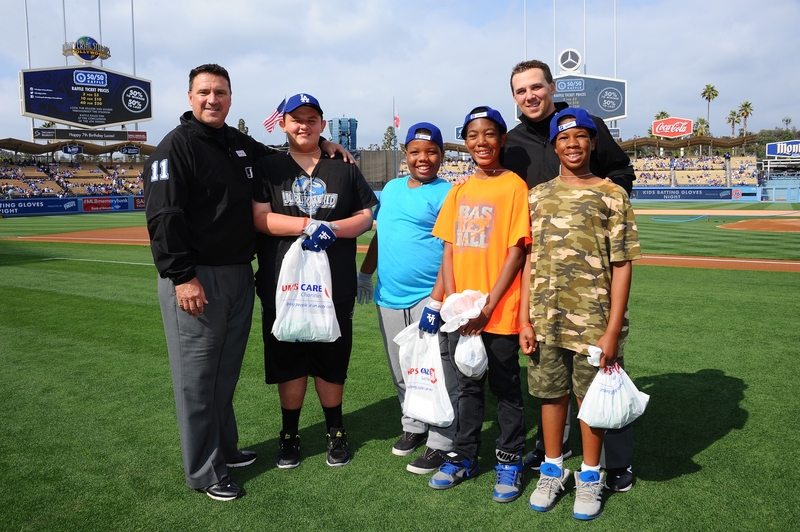 When UMPS CARE began its efforts to give back to communities around the country, umpires took notice long before the rest of the league. Most importantly, minor league umpires began to take notice, allowing the movement to grow into what it has become today. Tripp Gibson was one of those minor league umpires, ten years ago, when the major league staff began reaching out. Since then, Tripp has been an integral member in the development of UMPS CARE, and has seen it grow from its infancy into the wonderful and successful charity it is today. And he wants to see it grow even more.